I know I’m getting a little bit ahead of myself, so if you’re looking for Trails of History activities this weekend, you’ll find them in the April listings. Most of our sites will be open on Memorial Day, but not all of them. Please check the list to avoid disappointment. In honor of its 20th anniversary, the Luzerne Foundation is presenting $1,000 gifts to 20 community organizations. 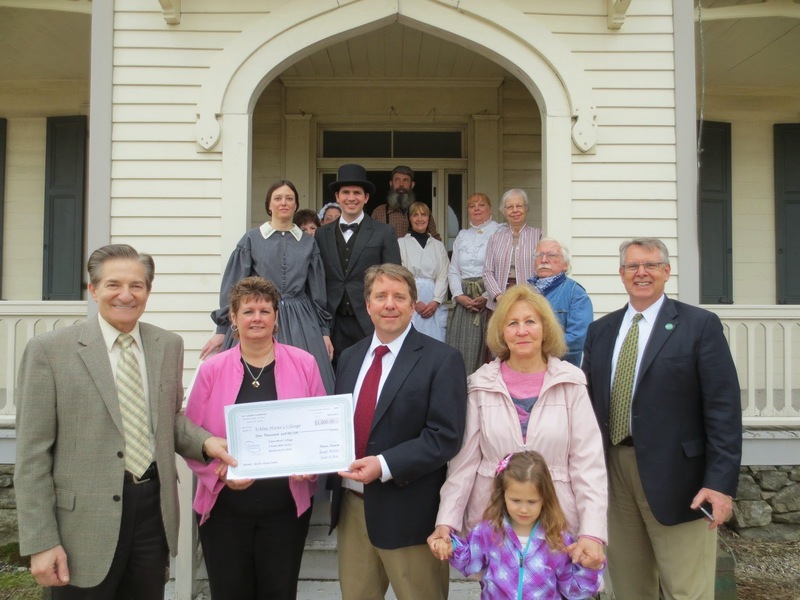 On April 22, Eckley Miners' Village received a surprise visit and a check. Thank you, Luzerne Foundation! May 24: Daniel Boone Dash!—this event features a 5K run and a 1-mile fun walk that wend their way through the grounds of the museum. If you want to be sure you get a race t-shirt, please register by May 10. May 17: MEET-U in 5 Trail Run—enjoy a 5-mile run through the grounds of Drake Well Museum and Oil Creek State Park and help the museum’s MEET-U educational outreach program. Registration fee is $30 but goes up to $35 after May 1. Call 814/827-2797 for details and to register. May 31: Blacksmithing Demos—monthly blacksmithing demonstrations on the grounds of Drake Well Museum by Oil Valley Blacksmiths the last Saturday of the month, through October. Included in regular admission9 am-2 pm. May 31: Wildcat Day at Pithole—help kick off visitation season at historic Pithole, the remains of a 19th-century oil boomtown. Admission charged. 10 am-4 pm. 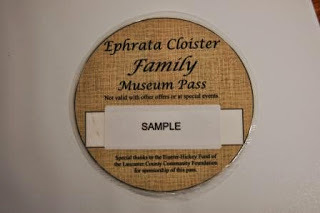 May 23: Ephrata Cloister Associates Spring Banquet—“Folk Customs and Traditions of the Pennsylvania Dutch” is the focus. Cost is $20 per person; tickets are available until May 9 in The Museum Store (717/733-6600). 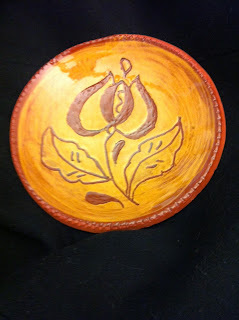 May 24: Clay Tiles—learn about Pennsylvania German redware pottery traditions and make your own clay tile. Part of the “Making History” workshop series. Cost is $15, $10 for ECA members. Call 717/733-6600 to register. May 31: Ephrata Cloister Chorus Fundraiser—featuring Kauffman’s Chicken BBQ. Tickets are available at the Museum Store (call 717/733-6600). $8 includes chicken, beverage, side dish, and baked potato; dine under the tent or take it home. 10 am until sold out. May 3, 10, 17, 24, 31: 19th-century Trade and Craft Demonstrations—planned activities are: 5/3 – Woodworking and Children’s Games; 5/10 – Textiles; 5/17 – Blacksmithing; 5/24 – Foodways; 5/31 – TBD. May 17: Garden Mart and Spring Garden Workshop—The Garden Mart offers free admission to OEV’s gardens, which will be filled with vendors and local garden-related organizations. The Spring Garden Workshop includes a full program of speakers, a tour of the gardens, door prizes, and lunch (must register for the full program by May 12). Details for both events, including registration options for the workshop. 9 am-2 pm. May 25: Garden Highlights & Beer Brewing Demonstration—find out what’s growing in the kitchen garden and learn how barley and hops become beer. Included in regular admission. 1-4 pm. May 26: Picnic on the Lawn—Pennsbury is open on Memorial Day and invites visitors to bring their picnic baskets and blankets. May 24-25: World War II Revisited—American and German WWII reenactors will be bivouacked on the museum grounds portraying field life in the European Theater of Operations, 1944-45. On May 24 at 3 pm, the “Andrews Sister Tribute Show” from First in Flight Entertainment will entertain the troops and homefront crowd in the Service Canteen (please bring your own seating). 10 am-4 pm. May 18: Harrisburg Jewish Film Festival—the museum will be the venue for Goodbye, Columbus (a screening and discussion led by Prof. Helen Khanzhina, starting at 2:30 pm) and Jews in Toons, a talk by Mike Reiss, writer-producer on The Simpsons (reception at 6:30, program at 7:30). The festival runs May 15-22 at other venues in Harrisburg. May 26: Memorial Day Observance—fallen soldiers from the Winter 1776 campaign will be remembered in a ceremony at the Revolutionary War Soldiers’ Gravesite behind the Thompson-Neely house. Free of charge. 11 am-1 pm. A Standing Ovation for Museums! A programming note: the Pennsylvania Military Museum, the Railroad Museum of Pennsylvania, and Washington Crossing Historic Park will be open Sunday, April 20, on their usual Sunday schedules. All other sites on the Trails of History will be closed. Okay, so I don’t think I’m prone to giddy outbursts on this blog (and I have a strict limit on the use of exclamation points). Those of you following Trailheads this winter may have thought that Eeyore had taken over (and sometimes I felt that way, too). So when I tell you what a thrill it was (yes, a thrill) to see a bunch of librarians give a bunch of museum folks a standing ovation the other evening, I hope you’ll believe me. It made my nerdy little heart swell with pride. I have to admit that I thought of the Trails of History sites as beneficiaries of the museum pass program. The program helps get the word out about our programs at no cost to us and brings family audiences to our doors who might otherwise not pay a visit. Anecdotal evidence indicates there has been some payoff in terms of memberships, repeat visits, and positive word-of-mouth (a very powerful factor in decisions to visit museums). I felt grateful that the Library System was including all of our sites and that the Lancaster County Community Foundation supported the program. I still feel that way. But at the awards presentation, LSLC Administrator Bill Hudson described the participating museums as partners in the effort to serve the families of Lancaster County and thanked them all not only for being part of the program but for showing up to be recognized. It was clear that LSCS is extremely (and justifiably) proud of the Family Museum Pass Program. The capper for me was that once all the museum partners had been called individually up to the front of the room, they received a standing ovation. It was a "wow" moment for me. 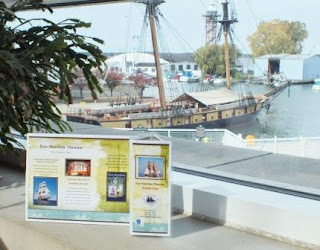 While I’m gushing on about this, I will mention that library patrons in Erie County can check out passes for admission to the Erie Maritime Museum. Let’s hope this idea can spread throughout the rest of the state. And I would be extremely remiss if I didn’t thank Renee Christiansen, youth services manager at LSLC, for her energy and all the librarians and museum folks who believe in the power of museums and libraries working together. 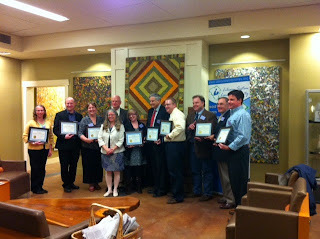 This past Saturday at The State Museum of Pennsylvania, we said “Thank You” to PHMC’s Volunteers of the Year for service in 2013 with our annual awards ceremony and lunch. We are extremely grateful for all the volunteers who contribute their time, talents, and energy to support the sites on the PA Trails of History. The Trailheads feature in the upcoming summer issue of Pennsylvania Heritage magazine will highlight this year’s honorees. So for the moment, I will say “thank you” again and add a “thank you” to all the staff members who work so hard to serve the public and care for our sites. 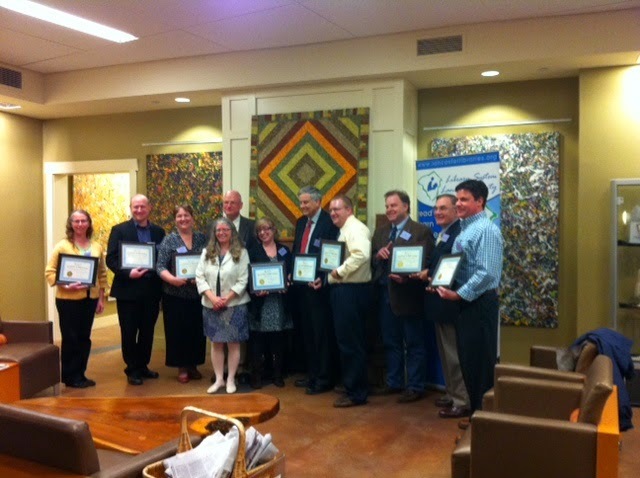 Pennsbury Manor recently received an All Star Award for 2013 from Constant Contact, which provides email management services. In honor of Pennsbury's 75th anniversary as a historic site, the Arbor Day Foundation will donate 10 trees to Pennsbury for every person who joins through this special partnership (which costs only $10). It’s really easy to do and a great way to celebrate the fact that spring is finally here (and the anniversary of course). 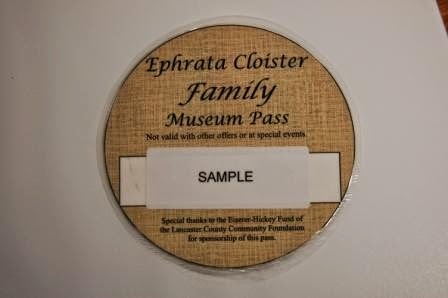 At the end of March, Ephrata Cloister debuted a new program for young visitors, their families, and their stuffed animals. The Stuffed Animal Sleepover invited kids to drop off a fuzzy pal who would spend the night and learn about the people and history of Ephrata. The children and parents returned the next morning to take part in some of the same activities. 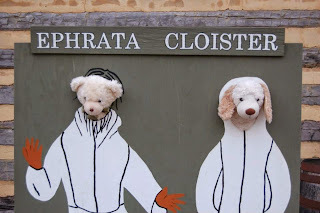 Upon arrival, each child received a packet of photos showing their stuffed animal in various buildings and then toured the site to share the experience. 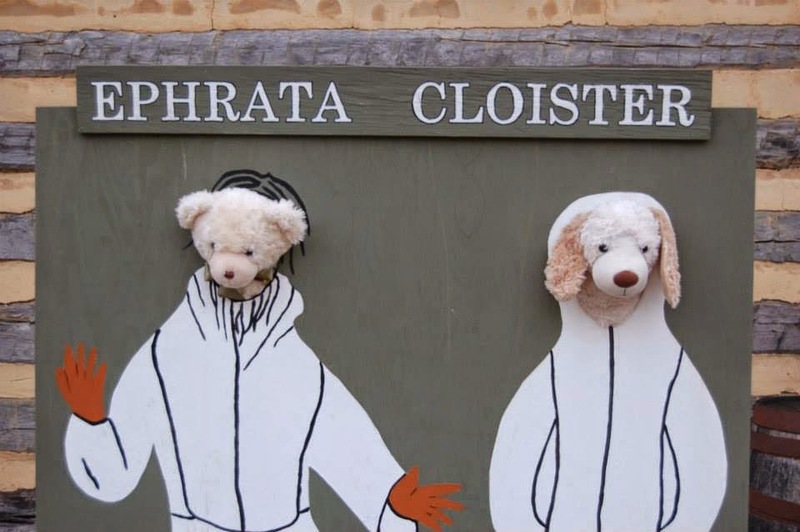 You can enjoy more stuffed animal photos on Ephrata’s Facebook page. Daniel Boone Homestead’s inaugural Beerfest was well-attended, selling out all tickets ahead of time. From the photos on Facebook, it looks like a good time was had by all. Tickets are currently on sale for the Washington Crossing Brewfest on May 3 and for Pennsbury Manor’s Brews and Bites on June 14. The Annual School of Coopering at Somerset Historical Center received some nice coverage from WeAreCentralPA.com, who invited Mark Ware into the studio for an interview. This weekend’s workshop is completely booked, but the waiting list for next year is already forming. Way back in February, I shared a photo of a redware dish I decorated while visiting with the Student Historians at Ephrata Cloister. Artist Ned Foltz showed us how to scratch the design into the dish, then took our work back to his workshop to be glazed and fired. Well, I’m pleased to share a photo of my masterpiece. It’s amazing what you can do when a talented artist shapes the dish, sketches a design, provides the tools and instruction, and applies the glaze. Thanks, Ned, and thanks again to the folks at Ephrata for letting me be part of the class. April 13: Weiser Interpretive Program—enjoy an afternoon of history. Noon-4 pm. April 12: Family Day—Today’s program features Kathy Newson, Titusville Historical Society, talking about getting started doing genealogy research (1-2 pm), as well as a scavenger hunt that explores the museum’s exhibit. Included in museum admission; special family rate – up to 2 adults and 3 children for $20. 9 am-5 pm. April 12: Little Mates Easter Egg Hunt—members of the museum’s Little Mates Kids Club are invited to tour the museum and ship, make Easter crafts, and visit with the Easter bunny. Not yet a member? You can join when you register for the program. RSVP deadline was April 4, so be sure to check ahead to see if tickets are available. Information on April events is in last week's post. Many, many thanks to guest blogger Linda Bolla for the text and photos today (the pun in the title is mine, so you can assign credit or blame as you see fit). The Erie Maritime Museum is located in the former Pennsylvania Electric Company (Penelec) Front Street Generating Station, which closed in 1991. 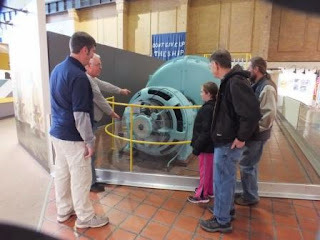 Part of the legacy left to the museum when it opened in 1998 is the #3 steam turbine generator, one of the five formerly in operation at Penelec. 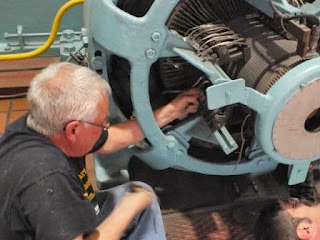 Power from the generator is collected on a rotating part of the machine called the “commutator.” Carbon brushes ride on the commutator as it spins, providing a sliding electrical contact. Volunteer Museum Guide (and retired General Electric Design Engineer) Rich Hall noticed that the carbon brushes, which should be visible in the exhibit, were missing. 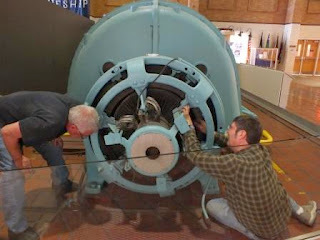 While the average visitor would not know this, the Erie Maritime Museum audience includes local workers and retirees from both Penelec and GE who are likely to notice this omission. 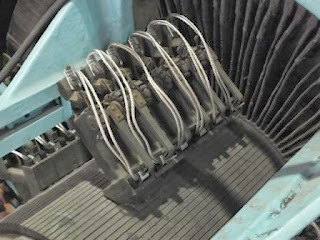 Rich networked with friends and colleagues at General Electric to identify the correct brushes this commutator used. Morgan Advanced Materials of Greenville, South Carolina, manufactured brushes to the GE design and donated them to the Museum. Thank you to Rich Hall, William Bird of GE Turbine Generators (Schenectady, NY), and Walt Konstanty of GE Motors (Erie) for their help in identifying and providing specs for the brushes, and to Roland Roberge of Morgan Advanced Materials (Greenville, SC) for manufacturing and donating the carbon brushes.